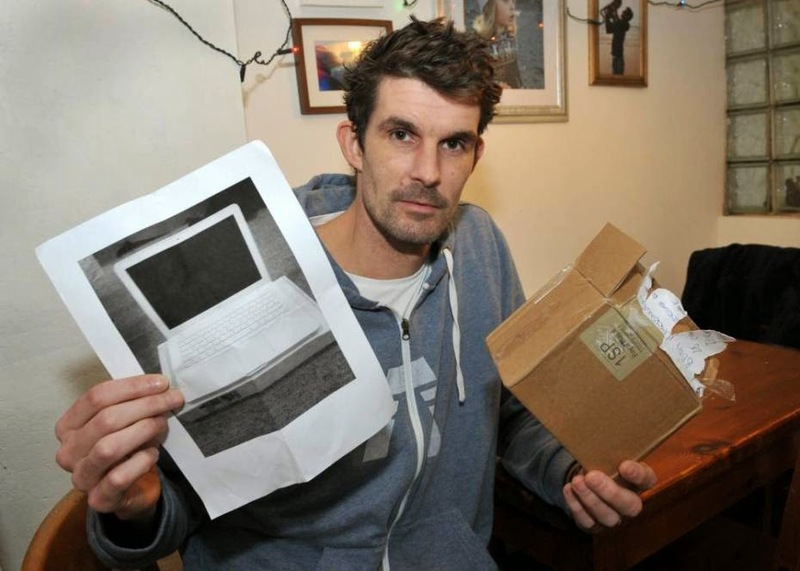 A surfer bought a laptop on eBay for hundreds of pounds – but was sent a photocopy picture of it instead. Paul Barrington, 38, fell victim to the scam after winning the auction for an Apple MacBook. His winning bid was £300 for the top-of-the-range machine that can cost up to £1,500 when bought new. But the bargain proved too good to be true when a feather-weight package arrived a few days later in a small, square box. It contained only a black-and-white photocopy of a photo of what Paul thought he had ordered. Paul, of Ilfracombe, Devon, had been forced to sell his last surf board to pay for the laptop and was hoping to use it to launch a new career as a wedding DJ. He has since been given a refund. ‘It’s the first time I haven’t had a surfboard since I was 10 years old but I need a laptop so I checked the listing and the seller’s rating. He has has been in and out of hospital in recent months with a lung condition known as Bullous Emphesima, which has meant he is unable to surf and had to give up his job in child care. A spokesman for eBay said: ‘We were very sorry to hear about Mr Barrington’s unusual experience. We’ll make sure he gets a refund as soon as possible and investigate the circumstances around this sale. ‘eBay takes the issue of fraud very seriously, with more than 149 million active global users engaged in transactions across 50,000 unique categories.